The Asian Elephant is so synonymous with India that it was chosen as India's National Heritage Animal by the environment ministry in 2010. However, various problems continue to plague these gentle giants, 29000 of which struggle to cope with deforestation, man-animal conflict, habitat loss and train accidents in an ever-shrinking space. Although poaching for ivory is not as rampant in India as it is in Africa, it only makes the animal a lot more vulnerable to the threat of extinction. Even though the government has announced several schemes and measures to overcome the threat from train accidents, they have not been implemented effectively. 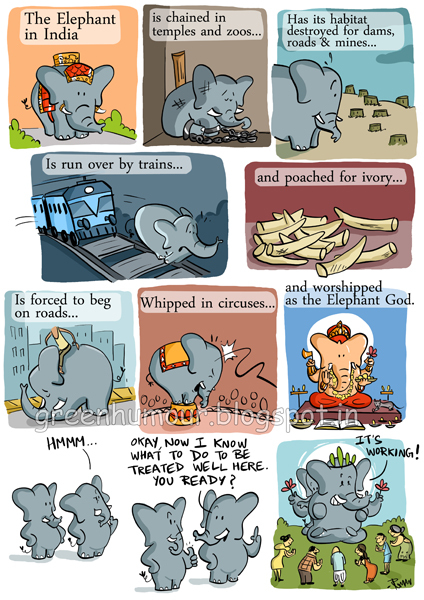 Ironically, 'Bholu the Elephant', is the mascot for Indian Railways! The very species that endorses the locomotive is being violated and slashed by it. 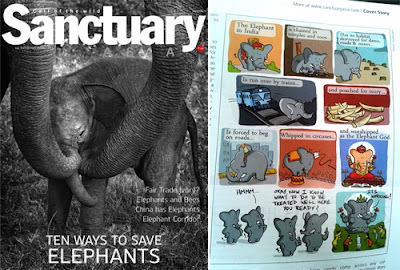 This comic is a part of Sanctuary Asia's Elephant special issue (October 2013) along side Vivek Menon's cover story on elephant conservation in India. Always a special feeling being published in Sanctuary Asia!